Situated at the northern end of Khreschatyk, Kiev’s Independence Square received global media attention in 2004 as the focal point of Ukraine’s Orange Revolution. Today, things have calmed down a little and the tented city that sprung up overnight has long gone. Independence Square, however, is still the city’s most popular spot for meetings, late night drinking and people watching. The glass domes found on the square are actually the skylights of Globus, an upmarket underground shopping mall that lies beneath the square (the press kiosk here is one of the best places to buy foreign newspapers and magazines). 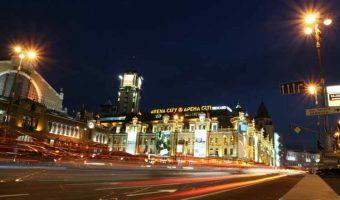 Independence Square is also home to the Central Post Office and the Hotel Ukraina. Map showing location of Independence Square. They come up to you and they are funny. Please don’t take photo with them before asking the price. Otherwise at the end they will ask for 1000 UAH. Visited Kiev Independence Square. Had a wonderful time. A polite young man, dressed in a costume who spoke fairly good English, provided some very good information about the city center, the orange revolution, politics, etc. I had no problem with providing a tip afterwards. Great place to check out and take photos, with lots of history around. But watch out for the Ukrainian scammers that hang around to rip the tourists off. The ones that are dressed up in outfits and will take photos for you then demand money off you. Then there are the guys with birds that will just put birds on you and try to take photos then demand money off you. If you can avoid all the Ukrainians trying to rip the tourists off then this is a nice place to take photos and take in the scenery. Best tip is to get other tourists to take photos for you as the locals may run off with your camera or demand money. I’m on Independence Square virtually every day and I’ve never been scammed. Regarding the folks who take pictures. Just use a bit of common sense. They’re obviously there trying to earn money. I wouldn’t say they were scammers. I saw this also its disgusting they prey on innocent tourists and rip them off. I would not consider this earning money when locals scam overseas visitors, I would call this robbery by intimidation. Is it a wonder why Kiev’s tourist industry is suffering when no one wants to come back? Use you brains folks. If a guy dressed as Tinky Winky from the Teletubbies approaches you and asks if you want your picture taking (or a man with a bird or whatever) don’t be surprised if they ask you for money. If you don’t have the common sense to see that coming then I’m sure you’ll have far greater problems throughout your life. Video showing some of the sights you could expect to see on a typical day at Independence Square. The main street in Kiev and a popular spot for both locals and tourists. Closed to vehicles at weekends.